The Overall Equipment Effectiveness (OEE) is defined as the fraction correctly made products relative to the maximum amount possible. By monitoring the OEE during each shift, it is precisely known when disturbances and problems occurred. Yet, as Nutricia in the Netherlands discovered, the current reporting methods are not adequate enough to determine the root cause of all problems. Inquiring from the operators then takes a lot of time, and the event is not fresh in their mind anymore. Therefore, the operators were recently trained to capture as much information as possible in the case of any significant disturbance. They even secure evidence as if they were detectives! To this end, within an existing OEE-toolkit, a template was developed. Digital forms help the operators to make good problem descriptions. The forms are framed by Sherlock Holmes-like drawings. Nutricia in Cuijk in the Netherlands became part of Danone in 2007. Nutricia produces baby food, mainly products in the form of powder which are sold under the brand name Nutrilon. Dissolved these are a substitute for breast milk. Nutricia produces many variants, for example for children who are allergic to food ingredients. It goes without saying that the quality requirements are high. After all, the scandal with contaminated milk powder from a now bankrupt Chinese company is still fresh in memory. It is also important to produce efficient, with as few losses as possible. This results in a high price-performance ratio. To detect losses and to prevent those in the future, Nutricia measures the Overall Equipment Effectiveness or OEE. Already for years, this is done with the aid of a software toolkit, originally installed by Blom Consultancy. The data-acquisition goes manually. However, at the moment a promising pilot is done with automatic input. For each production line, the OEE-toolkit registers the amount of correctly manufactured products relative to the maximum amount possible. Therefore, the key question was: How can we ensure that the operators, when an incident happens, make a problem description that is very accurate. So accurate, that immediate action can be taken when the problem is discussed during the production meeting? 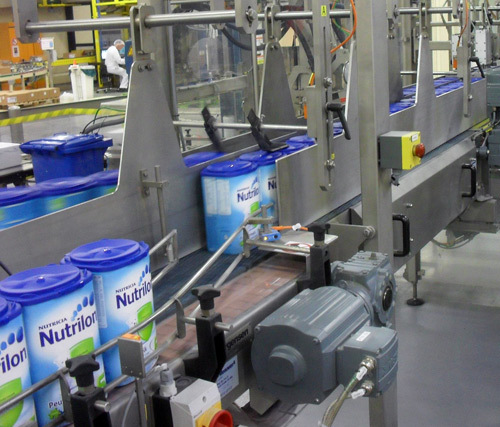 Packaging line for Nutrilon baby food. The operators lay down all information about production disturbances, like they were detectives! Where in the process or at the object? Why was it a problem? How often / how much did it occur? Providing only these questions still proved to be insufficient. One example: The When-question could be answered by filling in just the time. Often, it is also important to know if the problem occurred during a changeover, during the startup of production, or in the middle of a production run. Working with the forms might have a disadvantage: Every problem becomes unique in the database. That would make it hard to determine which problems occur the most via a Pareto-analysis. 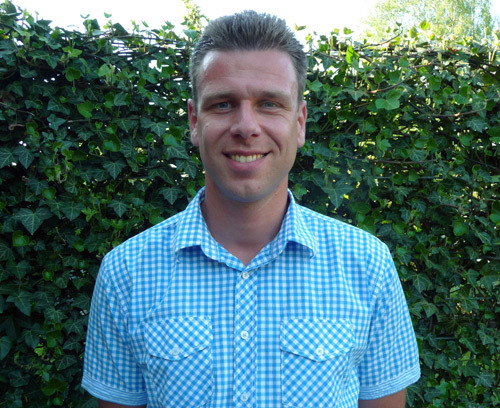 Arjan Den Hartog, performance manager at Nutricia: "During production disturbances we record 5W2H: Who, What, When, Where, Why, How & How Much"
Danone has a global sustainability strategy that is bearing fruit. In 2008 it was decided that the carbon footprint, measured in kg CO2 emitted per kg product over the whole supply chain, should be 30% lower in 2012. To this end a measurement system was built, based on the ERP-system SAP. The goal of 30% lower CO2 emission has already been achieved. Do you need help with the implementation of TPM?